Monitor progress, measure outcomes, and inform practice of the Second Step Program with our reliable, standardized social and emotional assessment, the DESSA-SSE. "Evidence shows Second Step works to teach skills, but the DESSA fine tunes the implementation, so each student is able to maximize the experience as we prepare them for excellence both academically and socially." What is the DESSA-Second Step Edition? The Devereux Student Strengths Assessment- Second Step Edition (DESSA-SSE) is a research-based, standardized behavior rating scale created in partnership with Committee for Children and customized to the Second Step Program. The DESSA-SSE is used to assess student skills related to social and emotional competence, resilience, and academic success. 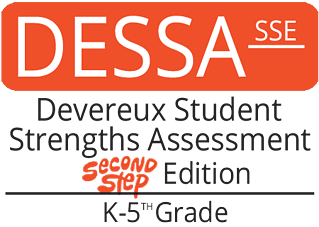 The DESSA-SSE is available for Kindergarten through Grade 5 and is designed to be completed by parents, teachers, and out-of-school time staff. Additionally, the widely-used and award-winning DESSA is available to continue measuring outcomes and spans Kindergarten through Grade 12. Both the DESSA-SSE and the DESSA are available via Aperture Education's DESSA Comprehensive SEL System. Monitor progress, measure outcomes, and inform practice with reliable reporting available at the individual, site, and district/program levels. "We recommend the DESSA-SSE as a customized way to score and track changes in social and emotional competence in Kindergarten through Grade 5 students quickly and easily." Quickly track changes in the social-emotional competence of students with regular progress assessments that determine if your students’ competency scores have progressed, stayed the same, or regressed during the rating period or over the course of the year. The DESSA-SSE reveals changes in specific social and emotional skills, and the sensitivity and reliability of the research-based assessment lets you evaluate the effectiveness of your Second Step Program during the course of the year. You'll gain insight into individual Second Step competencies and how each are progressing. Using the DESSA-Second Step Edition to monitor, you will have the ability to transform your practice with reliable data to inform your intervention decisions. Make the most of your time and Second Step Program by measuring the outcome of your efforts. The DESSA-SSE helps you understand the impact of your program with tangible data. Meet goals and compare data year over year to continuously improve your social-emotional goals and initiatives. The DESSA-SSE is a reliable, standardized assessment that you can count on to provide concrete evidence of program outcomes. Learn more about using the DESSA-SSE with your Second Step Program by filling out the form to your right. Join hundreds of schools and programs using the DESSA-Second Step Edition to inform their practice, improve outcomes, and bolster social-emotional competency.